TAUHAI. Otherwise spelled "tawhay", a Visayan word. Serene, peaceful. Evokes the sound of reeze caressing leaves. Of waves licking the shore. Of birds chirping, and the page of a book being turned. Of laughter & giggling, of innocent fun. Built on almost a hectare of beachfront property in West Cebu near the boundary between Toledo City and the town of Pinamungajan as the retirement home of Joe & Tess Cavada, TAUHAI can accommodate 48 guests in one cottage-on-a-pond, two (2) airconditioned barkada rooms, two (2) airconditioned family rooms, and four (4) airconditioned family suites that have the comforts of leisurely living: hot-shower, satellite TV, broadband internet, DVD player, soft & firm beds... and a stunning view from your bedroom verandah. TAUHAI is a garden... and a home. Upon entering the gate, your eyes are met by orchids, bougainvilles, gumamelas, anthuriums, dama de noche, dwarf coconuts, traveller's palms, and many other ornamental plants. A 200 sq. m. swimming pool adds a sense of leisure... and sport... to the garden ambience. 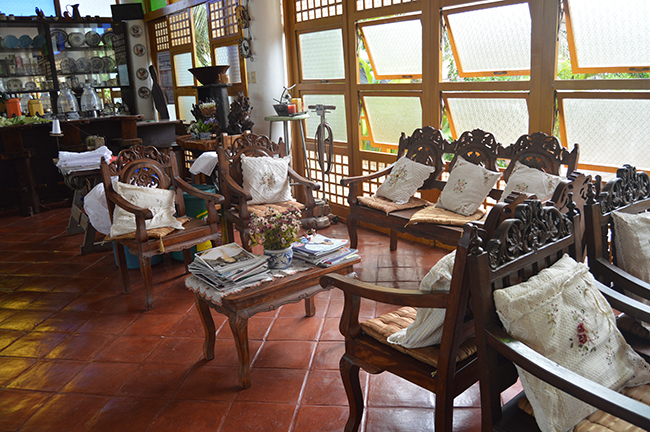 Vigan tiles, mother-of-pearl windows, hardwood antiques lend a touch of Filipino history & culture.